Six Sheets of Plywood are colour photographs of Balsa-wood models painted with varying concentrations of Mars black acrylic. The model acts as a place holder for a planned life size sculpture. The idea percolated and manifested over several months and is originally indebted to; an older photograph, a history of manual labour, the love of everyday objects and a rebuttal to mainstream ideas on beauty. This work also serves as a critique on prevailing trends in contemporary commercial painting and photography. Finally, Six Sheets of Plywood is a personal journey into temporal sculpture and performance remembering a childhood of exploration and making. The original photograph was taken for the Wandering series about five years ago. 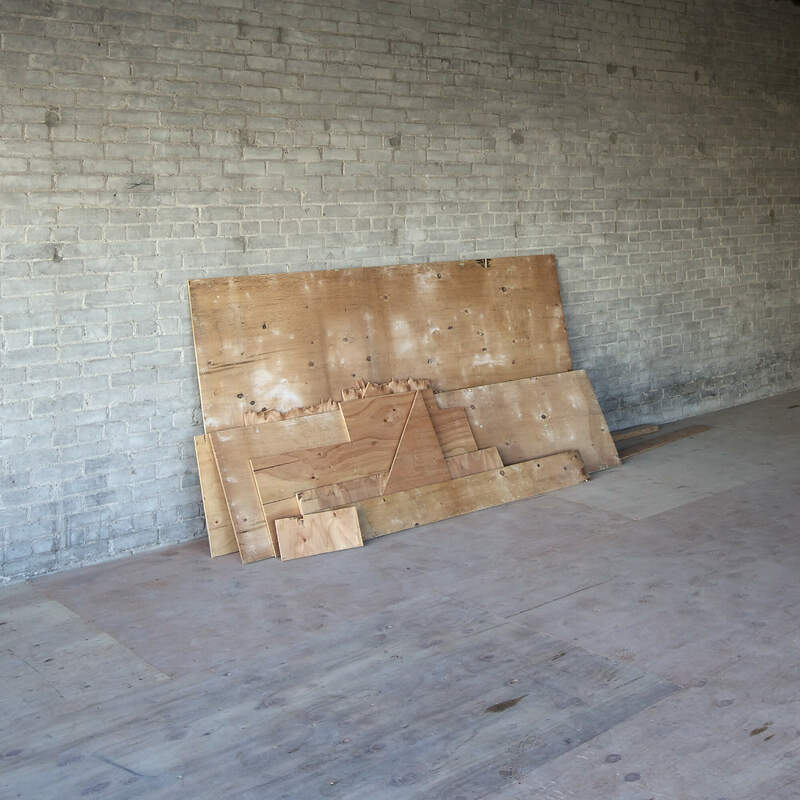 Shot through a window into what was once a variety store, the space contained several pieces of plywood leaning against a wall. That’s it, there was nothing else in that strange old room on Pape Avenue. The pace is now a semi-fancy coffee place. I’ve always loved this original photograph and think of it often. At the time I had planned to create a similar scene in a vacant property and re-shoot. The thought being to take the “found” and use it as a basis for a “made” object. So I think about this for years. It’s not the only thing I’ve thought about for years. If I’m honest I think of most of my ideas for years. If they don’t make it to that stage I tend to forget about them. The logic being that if I can’t be arsed to even think about them, I probably don’t feel they have a value to me and why bother executing. I have hundreds of these ideas in my head that might start to insinuate themselves more as time passes, sometimes I think I have enough to last the rest of my life, but that doesn’t stop me from thinking up new ones. Then I decided to think about a very big idea for a very big show called Building. This plywood photograph from the past and the ideas it spawned fits right in. So I start to rework all those ideas. To help I thought I would first try sketching what I planned. After a few attempts–and never approaching what felt like what I wanted–I took foamcore and cut it into scaled 4 x 8 pseudo sheets of plywood, then those 4 x 8 sheets were cut into various sizes and shapes of subsidiary plywood chunks. I arranged those new pieces to emulate my remembered Pape Avenue found plywood structure and took photographs in the studio. I sculpted what I wanted rather than sketched it. Those images got me closer. Then I bought balsa-wood and repeated the foamcore exercise but with a more methodical approach and an architects scale. This got me closer closer to what i had imagined for years and I was pleased with those results. I thought I was finished. I thought at this point all I had to do was keep re-arranging the pieces to create various sculptures that I could then document with the camera, break them down, re-form and re-shoot. But after a few weeks of this great smug feeling–that I thad finally executed an idea I had thought about for years–I planned some more steps. I took the pieces and painted the raw balsa with varying degrees of black acrylic paint and voila. I’m VERY happy now. I have the seeds of one more solid idea for the Building exhibition. Again, these are models for a bigger and more involved piece that would use real 4 x 8 sheets of plywood. This is the model. That final piece would be about making sculpture and about re-arranging them to create temporal work that I would then document with my camera before reconfiguring or breaking them down completely. The photographs will end up being a record of the sculptures.